As I was checking up on the status of my iPhone 4 case (on backorder from the supplier until the 16th of November), it suddenly struck me – the telcos are missing a massive marketing opportunity. In Australia, why don’t we see any Telstra, Vodafone or Optus branded iPhone cases out in the wild? Why do the telcos ship the phones without any form of case for protection, making them more prone to damage until users get around to buying it a case? I’m a prime example! It’s a huge marketing and branding opportunity for the telcos that’s going begging – for example, a custom red iPhone case with a big logo would be a great way for Vodafone to market its brand through users of its mobile service. 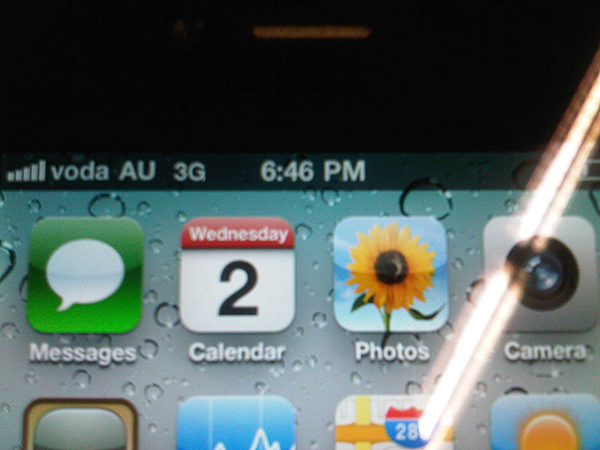 Looking at my phone, the only thing that brands it as Vodafone is the tiny “voda AU” at the top of the screen (pictured). For just a few dollars for each merchandised case, surely it’s worth it for the telcos to produce these and give them away with their most popular phones, such as the Apple iPhone 4S, Nokia N9 and Samsung Galaxy S II.